Your store will send e-mail notifications to customers when they place their orders. Squarespace allows you to easily customize these e-mails in Site Manager→Commerce→Email Notifications. Order Confirmed Message: A message is sent immediately to a customer when they place an order. Order Shipped Message: An order summary and a message are sent to the customer when an order is marked as completed in the Order area of Commerce. Within these e-mail templates, you can customize the messages that are sent. 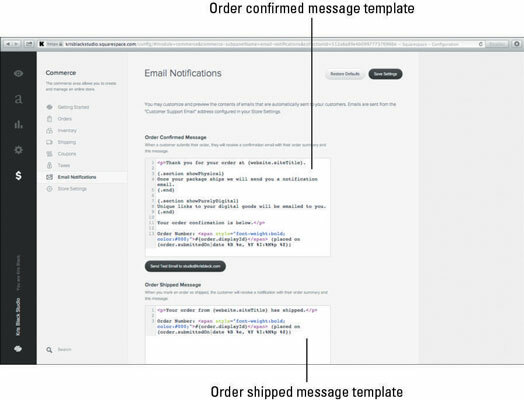 You can also customize the header and footer of e-mail notifications sent to customers from your site. If you decide to customize your messages, do not remove the template code within brackets. This code pulls information about the order to place in the e-mail messages. If you have experience writing HTML and CSS, you can customize the formatting of the messages. Be sure to test the e-mails using the Send Test button below the Order Confirmed and Shipped messages. The Send Test button will send test e-mails to the e-mail address set for the Customer Support Email setting in Store Settings.